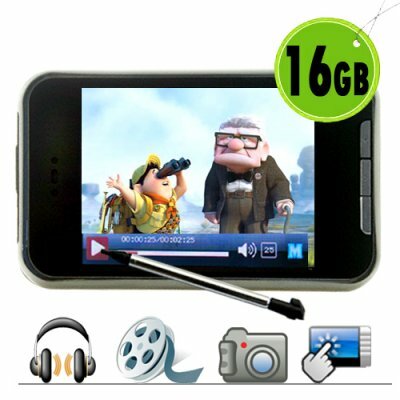 Successfully Added 16GB MP4/MP3 Player with 2.7 inch LCD - Pocket-sized PMP to your Shopping Cart. 16GB Portable Media Player (PMP) with crisp TFT LCD touchscreen. Many functions and features, starting with an easy to use interface for accessing music, videos, pictures, e-books, and portable data storage. If you want an MP4 player perfect for videos, then the crisp 2.7 inch TFT screen is a thing a beauty. Reading and viewing pictures is also a pleasure with the bright and crisp LCD, and can be easily shared with friends sitting next to you. Playing your MP3 collection is simple and fun with the simple store and go design of the functional USB connection to the unit. This is a PMP with an incredible amount of potential for fun and for practical applications, and is available for a much lower price than you would ever get for a branded PMP with only some of the same functions. Everything that anyone could possibly want in a Portable Digital Products is once again available at a low wholesale cost and direct from Chinavasion Electronics. Bonus: Premium quality gold plated earphones now included! FM Radio record mode. Save your favorite program to listen to again. Does this unit have both a photo camera and digital video camera (DV Camera)? Yes, this unit has both a picture camera and video camera function. It can record on a full battery approx 60-90 minutes. The size of the recorded video file and length of battery life depend on the recording setting you use. This unit plays MPEG4 files, which usually have the file extension of AVI or MP4. This unit does not play the Apple protected video files that have the MP4 extension, that is a different file type. I have a problem with converting any video codec through its software to .AVI, what am I doing wrong? When converting a video using the provided software into .AVI file, make sure the resolution is set at 320 X 240. If you are unable to play the converted file, this is due to the resolution being set to less or greater than 320 x 240.
on 2010-06-22 22:26:30 Really cool gadget!!! It's an amazing device, e-book reader, FM radio and even a camera!!! Good image and beautifull menu. I would say it is a great mp4 for the money except it is a great mp4 period!! You just can't beat this for the price (16gb) plus expandable with a mini sd card. The only issue that would prevent me from giving it 5 stars would be the firmware issue like Shaun said but still a GREAT product!! Great little device. Everyone comments on how small and light it is for what it can do. The firmware could be better (the interface takes some getting used to), but other than that it's just awesome. You just can't beat the price for something with this many features and this much memory.